If you are looking for information on the ATC Healthcare Services franchise business opportunity, ATC Healthcare Service franchises or ATC Healthcare Services franchising, then you have come to the right place. despite all the talk of a recession looming? In fact, while many companies are tightening their belts and hunkering down to weather the storm, according to Department of Labor statistics, the healthcare industry will experience an astounding growth rate of 22% through 2016! Additionally, Medical Staffing is the fastest growing segment of the staffing industry, with $10.6 billion dollars of revenue generated in 2006, and an expected growth rate of at least 7.5% for the foreseeable future! If you have strong marketing and management skills, then the ATC Healthcare licensee model is right for you. ATC Healthcare, a nationwide leader in medical staffing for over 25 years, is looking for motivated entrepreneurs who want to partner with us to expand our presence in your local area. Our unique licensee program is designed to alleviate many of the pitfalls that plague so many start-up business owners and allows you to focus on what's really important - recruiting staff and developing relationships so you can increase your profit $$$$. 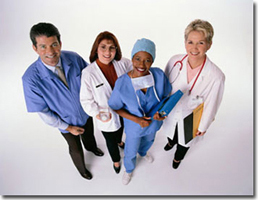 Healthcare benefits for all field employees. E-cards and Daily pay. ATC recognizes and values the fact that the local owner/operator is an entrepreneur and committed to success. You have the best of two worlds - the benefits of a national company supporting the market expertise of your Local business. ATC Healthcare is the right company for entrepreneurs to partner with. Today's economy calls for change with experience. Join our nationwide organization of successful medical staffing licensees. Our experienced management team will lead the way for you!!!! ATC Healthcare is one of the largest providers of medical staffing in the United States and is actively seeking licensees with various backgrounds throughout the country.